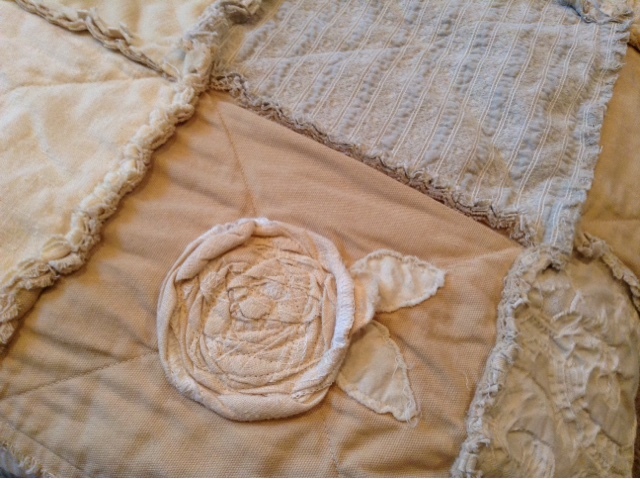 The journey of this QuiLT is such a wonderful one!! It started with a sweet customer finding my shop on etsy & working together on a custom batch of GaRLaNDS. Via the design process & conversations throughout we learned we were very local to each other. Etsy is an amazing thing ... I send packages all over the world (France, Austrailia, Israel, Africa, all North America) so to end up finding each other so close to home was pure serendipity. So ... 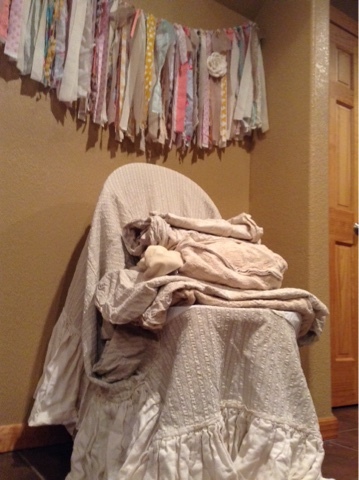 I created her custom garlands (which I'll share some peeks of in the near future), & she happened to ask if I might consider creating a quilt!// throw utilizing her beloved slipcovers. 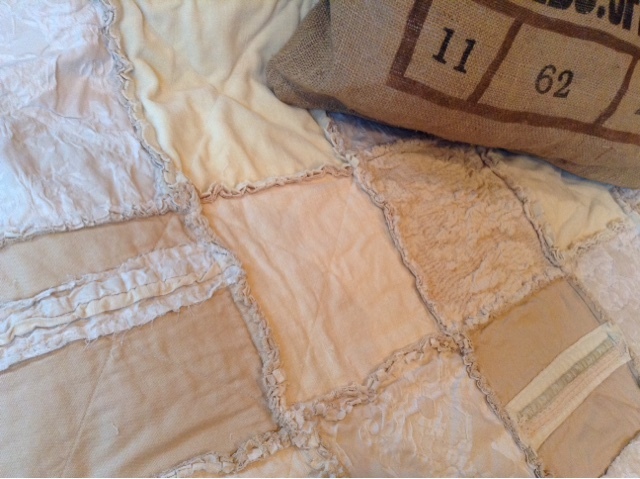 These were stunning textured ruffled slipcovers in the most delightful romantic classic shabby chic style but ... they had lived their life. There well worn (well loved!!) so she had stored them away for quite some time. 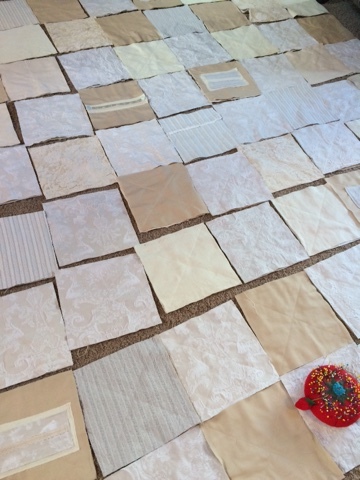 I spent hours (& hours & hours) cutting quilt pieces from all those remnants & arranging them just so. I added some trims & bits & pieces & layers to some of the solid squares adding more wonderful texture and depth to the final quilt. 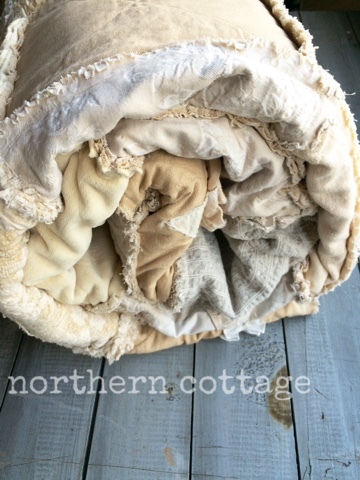 This was not an easy quilt to create (cutting around all those zippers & bulky seams, carefully on the watch for areas too worn to incorporate while grafting enough fabric to make large enough squares while balancing texture & tone. 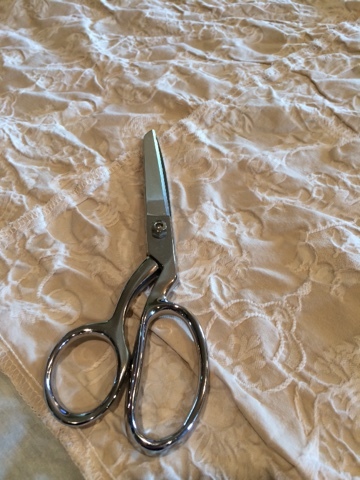 I broke three needles & a pair of shears to prove it .... But I'm in absolute LoVe with final quilt!! 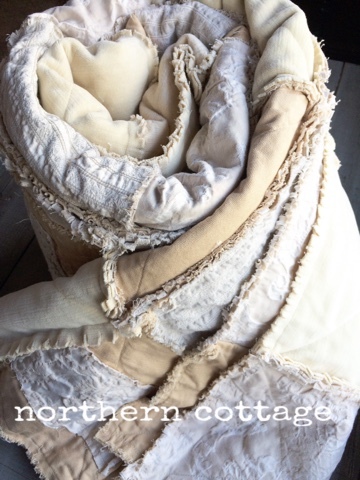 I'm beyond thrilled that it will continue its JouRNeY being well-loved & well-used & snuggled in everyday life moments!! 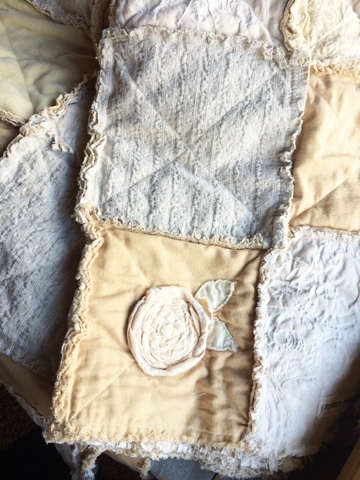 While I may not have a specific listing in the shop for a MEMORY QUILT as each creation is so unique & would be created do personally but would love to chat about creating something special for you or someone you LoVe // c'mon over and check out the SHoP and we'll visit!! Wow, that wonderful quilt is absolutely gorgeous! What an amazing job you've done ❤️. 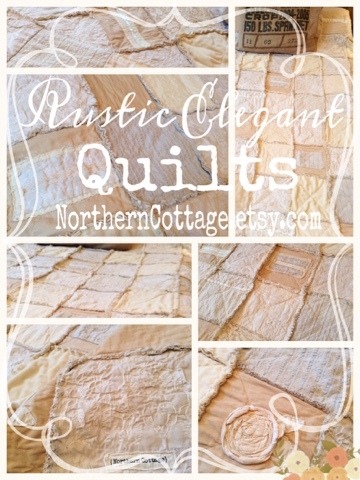 I love to see a picture of the whole quilt! !